ON THE STEEL BREEZE is only ten days from UK publication, and at least one bookseller seems to have copies in stock already, although they may not yet be for sale. Having just returned from America, and with my post still to be collected from my neighbour, it's entirely possible that there might be a finished copy in my mail as well. I'll find out soon enough. It's always a sobering moment, the first time you hold the end product. Months or years of work, distilled into a rectangle of card and paper. This is it - no more changes now. It seems odd to have said so little about this book, but I swore some time ago that I would avoid talking it to death before publication, a trap I suspect I fell slightly into with Blue Remembered Earth. On the other hand, I'm genuinely excited to see what the world makes of it. And, of course, not a little nervous about that same reception. This is the middle book of the "Poseidon's Children" trilogy but, from my standpoint at least, it feels like quite a different book to its predecessor. In my more pretentious moments, I've suggested that this is the darker second movement of a symphony, and there's no doubt that, in parts, the book is markedly more violent and dystopian than Blue Remembered Earth. If BRE explored some unabashedly utopian ideas, then OTSB offers a sort of critique or reflection on where some of those trends might end up given another century or two of development. Yes, stuff goes wrong in this book. Bad stuff happens to people, people do bad things to each other, and there are deaths - quite a lot of them, in fact. That's not to say that it's an out-and-out dystopia, any more than the real world of 2013 is. But there's a good deal of peril, there are ominous developments, and things that we might have thought we understood at the end of BRE turn out to be ... otherwise, and not always in ways we might have wished. Hope you enjoy these excerpts, and (if you soldier through them) that they provide some incentive to read the whole book. I enjoyed the World Science Fiction Convention in San Antonio. As always, I'm left with slightly mixed feelings about what I expect to get out of such a gathering, as well as what I'm actually bringing to the show by being there. But there's no doubt that from my perspective as a writer and program participant, it all seemed well organised. The convention centre was, from a British viewpoint, typically huge and at times bewildering in its layout. I never did make it to the Green Room. But the panels seemed to be well attended and judging by the feedback, enjoyed by both participants and audience members. After two attendees were not able to make it, the panel on SF art and artists as writers turned out to be just Joe Haldeman and myself, but we enjoyed ourselves and I think we kept it just the right side of self-indulgence. Luckily, because I wasn't very well prepared, Joe had brought some examples of his own art along. I did a few other program items but the one that will stick in my memory was the panel on the legacy of Iain Banks and the Culture books. Ably moderated by Vince Docherty, the panel also included Kim Stanley Robinson, Ben Jeapes and myself. In his opening remarks, Vincent stated that a female panelist had been unable to attend, which was why Ben had come on at short notice. (For the record, I'm not hugely bothered about panel parity on a given topic provided there is a good shot at balance across a convention's entire programming track, but it was good to hear that efforts had been made). What made this panel memorable, in my view, was that for once none of us were there to promote our own works or careers - not that my fellow panelists would have been so crass as to do that anyway, but it was one hundred percent Iain and his legacy that we were there to discuss. It was an honour and a privelege and I hope we rose to the occasion. I knew Iain only slightly, as I've written elsewhere, and I don't think Ben had met him. But we had all been saddened by his death, and brought to a renewed appreciation for the huge body of work he left us. Stan Robinson, though, had known Iain much more closely, and over a much longer span of time. It was wonderful to hear Stan's thoughts on both the books and the man. SF is much the poorer for Iain's passing, a fact that I think will only become more evident as time passes. I didn't go to the Hugo ceremony, so I missed the controversy, such as it was. My wife was in town with me, but since she did not have an attending membership, we decided to go to see a film instead - Elysium, during which I mostly slept. I couldn't summon tremendous enthusiasm for the Hugo evening anyway. Some undeniably good works were nominated, and I didn't sense any great outpouring of anger after the results. I'd have liked 2312 to do well, certainly, but John Scalzi has been such a force for good in the field, taking a genuinely heroic stand, that I doubt anyone would have much begrudged his win for Redshirts, quite aside from the fact that it had many admirers. The fact is, though, that I didn't even vote. I just couldn't summon up the enthusiasm or the energy, in a professionally difficult year in which I'd read almost nothing eligible and in which the one book I did rate highly - 2312 - was to some extent likely to overshadow my own eligible novel, Blue Remembered Earth. (Stan's is the better novel, though - go and read it). I needn't have worried, though. When the full Hugo results were made available, nothing of mine had come to close to being nominated, let alone winning. Normally there's a work or two of mine somewhere down below the cutoff, which is enough to provide some crumb of consolation, but this year there was nothing. I suppose I shouldn't be too surprised - I've made plain my thoughts on SF's year-long awards circus - but it was sobering all the same, as if my entire SF career was happening in some parallel world entirely removed from the Hugos. To be fair, I have had one Hugo nomination, for Troika back in 2011, for which I was genuinely grateful, and which is one more Nebula nomination than I've managed to notch up in 23 years of professional publishing. All of which probably sounds bitter, but actually I'm more bemused than disappointed. I do well enough commercially, and people whose opinions matter to me occasionally say nice things about my fiction. My short fiction is widely reprinted and anthologised. But the field has two conspicuous badges of merit, the Hugos and the Nebulas, and judging by those I'm just barely on the map. Rather than end on a downbeat note, though, I'll reiterate that I enjoyed the convention very much. I appreciated the work that went in behind the scenes, and I saw a lot of people having a great time. I was personally disappointed that my friends from Helsinki did not succeed in winning their bid for 2015, but - hey - London is next. And awards or otherwise, I hope to be there. 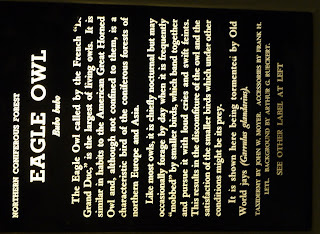 Eagle Owl caption, Field museum of natural history, Chicago. I have no idea why the upright image insists on displaying like this, but I'll fix it when I return to the UK. Among many things about the wonderful Field museum, I loved that they had made no attempt to update the dated diction and tone of their older captions. I wish more museums kept faith with the past in this fashion, rather than constantly chasing an ever decreasing attention span. 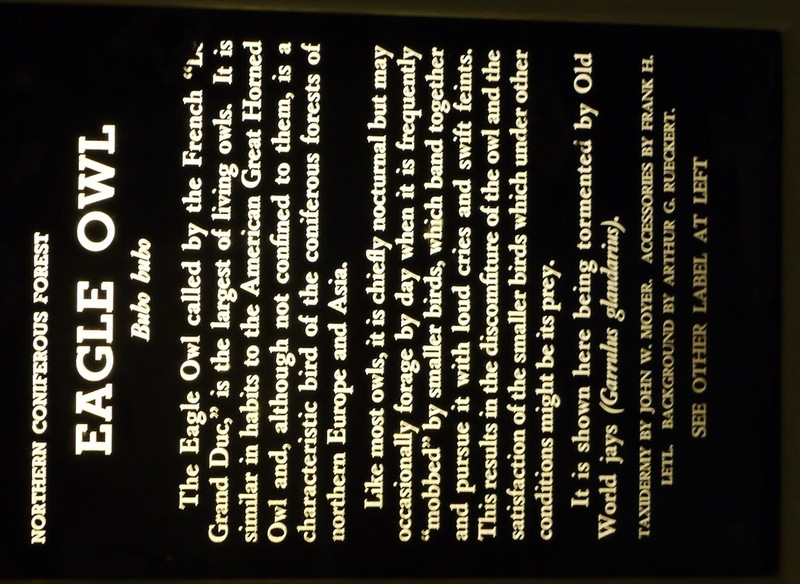 "This results in the discomfiture of the owl", indeed.